Our exclusive apartment has a green surrounding and is still located conveniently. The furniture is mainly made of larch wood. The garden shows off huge trees. The architecture plays with the materials wood, natural rock and glassand unites these in a style adjusted to the typlical rural architecture. 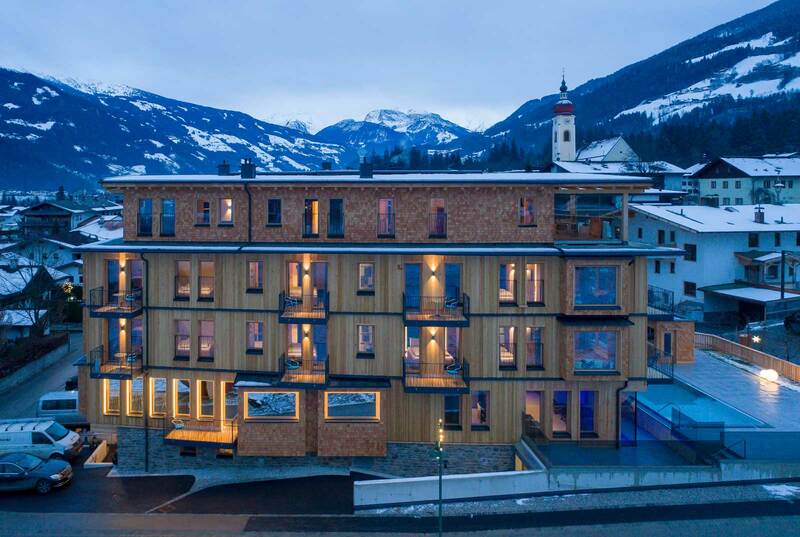 Each of the thirteen exclusively equipped apartments which are flooded with light guarantees a fascinating view on the surrounding alpine world and a happy and a carefree stay. The union of the independence of an apartment and the convenience of a hotel with such a good price-performance ratio is outstanding. You can relax after ajoyful vacation day in the spa area which includes a Finnish sauna, an organic herbs arolla pine sauna and a family textile sauna outside. The heated wellness pool in the open air with a wonderful view on the mountains guarantees happiness and luxury. Our apart hotel is located in a quiet and sunny location, is next to a golf course in Uderns and is in the heart of the Zillertal Ski Areas. The ski areas Spieljoch, Hochfügen, Kaltenbach, Zell-Gerlos and the glacier in Hintertux are accessible easily and fast. Thecross country ski track is right in front of our apartments and the ski bus takes you to the next ski area in only two minutes. The clovernames of the apartments should symbolise that you are lucky if you decide to stay here. We will do whatever is possible to offer you a carefree and joyful holiday. Our wonderful apartments, our hospitable staff, the numerous summer and winter activities, the exquisite cuisine, the spa area and many additional offers will take care that you definitely enjoy your stay. All you have to do is to relax and to forget your daily routine in your special Apart-Hotel in Tyrol. All our apartments are designed in a high-end and luxurious style. Still there are some variations in size and partition, therefore, it is highly likely that everybody will find his or her convenient apartment. We will be gald to give you some advice to choose the ideal apartment for your tour group. In sum we offer thirteen apartments for groups of two to fourteen people. In our apartment hotel you will find numerous way and offers to relax. Finnish sauna, organic herbs sauna,pool, etc. In our apartment hotel you can enjoy the luxury of a four star hotel. We serve the breakfast in your apartments. You can have your dinner in the in-house restaurant ‚Jedermanns‘ on the ground floor which is commercially separated from the apartment hotel. The operators will be happy to welcome you there.